Week after week (after week! ), employees and management teams are subjected to tedious office or company-wide meetings. It's no wonder most employees cite meetings as unproductive and boring. What if you could break the stale meeting mold and provide an opportunity for team building that will engage the members of your staff while boosting creativity and efficiency? Reinvent your meeting strategy by holding a destination meeting. Have your staff clear their personal and professional calendars for a day or two, set email autoresponders to "out of office," and advise your team to come prepared to work hard but play harder. Holding meetings at an off-site location provides a change of scenery, a relaxed, casual environment that will help put personnel at ease, and eliminate regular workday distractions. In turn, creativity, problem-solving skills, focus, and communication is enhanced. Find an off-site meeting location that will accommodate your needs including enough space for the number of employees that will be attending, seating, audiovisual equipment, meals, team activities, and lodging accommodations. When was the last time you worked with your team to solve a challenge while floating on a lake in a kayak? Or took your employees on a hike to a scenic overlook while brainstorming ideas for new products? Getting out of the boardroom and into nature, while simultaneously getting some blood flowing, is a great way to inspire your staff. Take your team on an adventure and watch them transform from complacent to innovative. It's "Team Building" Not "Team Boring"
Team building comes in a number of forms and can be as simple as dividing them into smaller groups and presenting them with a competitive challenge like a team scavenger hunt or giving them a task such as constructing a statue of a horse using only marshmallows and toothpicks. The important thing to remember is that these types of activities are meant to stimulate communication, participation, and bonding. Providing a fun after-hours event that doesn't require any "work" is a great way to show your staff that you appreciate their efforts and also understand the importance of having time to unwind and enjoy themselves. Reserve space in your meeting agenda for team happy hour at a bar or lounge within walking distance of your venue. Hold a "prom" or themed ball complete with costumes and a chocolate fountain or hire a DJ or karaoke service and dance or sing the night away. A movie night complete with popcorn and classic theater candy is another fun idea. Meetings don't have to be boring! 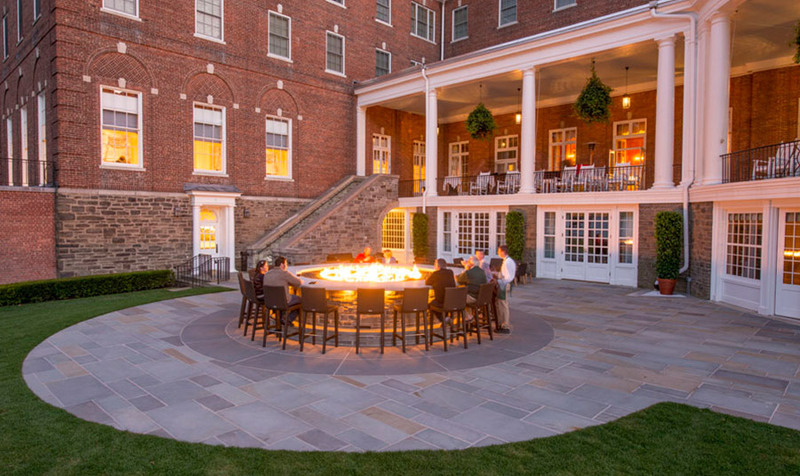 The Otesaga Resort Hotel, located lakeside in Cooperstown, is the perfect venue for your destination meeting. With more than 30,000 square feet of meeting and event space, luxurious accommodations, easy access to Lake Otsego and other natural areas, on-site restaurants, bars, and catering, and a number of amenities to encourage play and relaxation, your meeting will feel more like play than work.